We’ve already told you about the best Toronto breweries to hit up, but what if their lines are around the block and it’s -10˚ C? What if you’re now ravenously hungry after waiting an hour and a half in line to get that much-coveted bar seat? What if the Leafs are on, and the brewery doesn’t have a TV? Sometimes you just need a bar, and we’ve got you covered with this list of the 10 best Toronto bars, where you’ll find no shortage of local and international beers. Grab your puffer coat, rally your friends against the cold, and pull up to one of these spots in the name of great beer. Get Well is every Torontonian’s favourite arcade bar, and the great news is they have a killer rotating beer list to boot, be it bottle, can, or tap. With retro furniture and quirky decor to match the vintage video games available to play, Get Well is a bustling hipster haunt on a Friday or Saturday, but chill enough to actually catch up with friends on a Monday or Tuesday. Here you’ll find 13 beers (almost exclusively local) on tap in a wide range of styles, and pretty much anything you could ever want in a bottle or can. Grab a beer and settle in with a slice of pizza courtesy of North of Brooklyn's window at the back of the bar. From the outside, the Only Cafe looks like a coffee shop where you’d find hippies crooning over their guitars. But don’t let the freshman college dorm vibes fool you: The Only Cafe has been around for over 30 years, and for good reason. 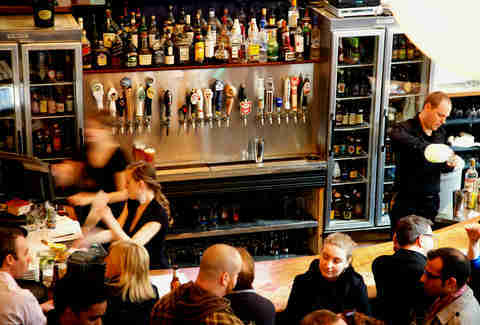 It boasts one of the most extensive beer lists in Toronto, with 230 bottles and 25 local craft beers on tap at any given time. 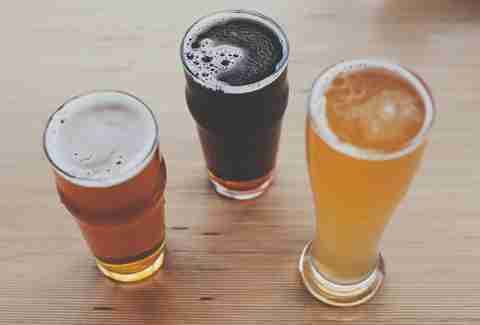 While they have a selection of wines and can make you pretty much any well drink you’d like, the focus is here on great beer that hails from both near and far. Bar Hop’s series of craft beer warehouses is one of several successful franchises that have arrived in Toronto in recent years. Bar Hop Brewco is the largest of its locations, and the ideal spot to meet friends after work or before the game with its proximity to downtown, Scotiabank Arena, and Rogers Centre -- plus a patio that seats over 100 for those summer months. More than this, Bar Hop features 36 beers on tap both local and international, with plenty of examples of numerous styles to keep all beer drinkers in your party happy and well-hydrated. While Bar Hop is not a fully fledged brewery per se, look out for their collaborations with much-coveted local beer makers such as Blood Brothers and Left Field. 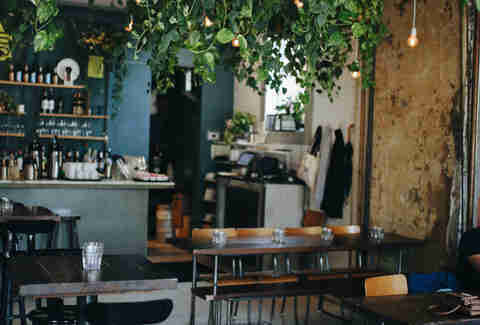 Beer drinkers across Toronto gasped in horror when it was announced that Bar Volo, Toronto’s premier craft-beer drinking destination, would be closing after almost 30 years due to redevelopment. But how could we ever fear that this would be the last from Morana brothers Julian and Tomas? Rising from the ashes of Bar Volo is Birreria Volo, its industrial chic younger sister on College Street. 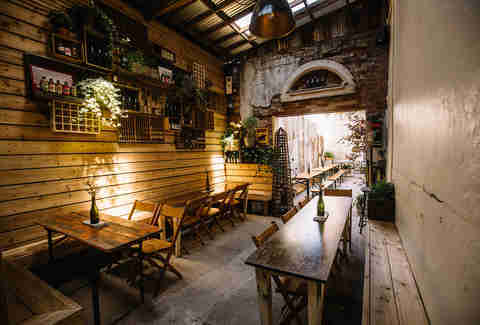 Nestled in a 10-foot-wide alleyway, get cozy at Birreria Volo and pull up to a communal table to try out rustic ales, ciders, natural wines, and their “cucina povera” (poor man’s kitchen) Italian-inspired snacks. And don’t worry -- rumour has it that Bar Volo may be making comeback. Located in the cellar of a historic building near St Lawrence Market, C’est What has been a Toronto craft beer institution for more than three decades. And there’s good reason for it: a healthy array of board games and billiards, a cozy underground atmosphere perfect for hibernation on winter nights, complete with over 42 taps and 20 bottles of rotating beers, exclusively Canadian with a focus on Ontario. 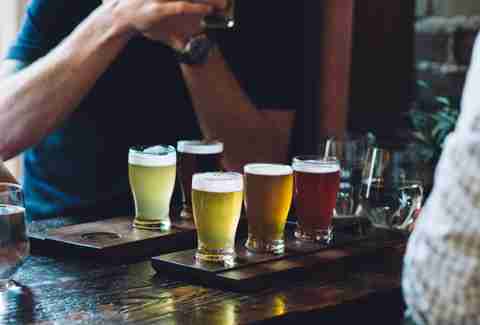 C’est What are the old school purists of the craft beer bars, with a mandate that focuses on single-batch, all natural brewing and fresh and unpasteurized beer. Beyond the beer, they’ve recently switched their liquor rail to entirely Ontario craft for those who prefer something harder. Boxcar Social is like your funny, well-dressed cousin who shows up at Thanksgiving to impress the whole family with anecdotes of the successful launch of their highly profitable tech start-up. Annoyingly precise, but you love ’em anyways. Boxcar Social prides themselves on a highly curated rotating list of the best coffee, whiskey, wine, and, most importantly, beer. Their rotating taps (available at their Harbourfront, Riverside and Temperance locations) and bottles and cans (available at Summerhill) focus on celebrating the craft beer boom the GTA has seen in the last 30 years. 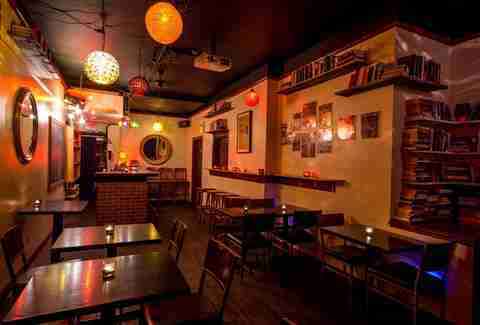 Bring someone special here on your third or fourth date to prove you really know your stuff. Just looking for a relaxing night out with a few friends? Tequila Bookworm has you covered. The interior has the vibe of a college bar with graffiti wall art, but the beer and wine list speaks for itself. A rotating tap list focuses on up-and-coming small batch breweries, while the bottle list is a wide range of farmhouse ales and saisons. Their drinks menu is exclusively Ontario craft, and they pride themselves on not carrying Corona, Heineken, Strongbow, or Bulmers (beer snobs rejoice). Grab a pint and get in the queue for the hidden gem of a patio, perfect for lounging in the summer months. Tallboys holds the title for carrying the most cans in the city, with a strong focus on Ontario craft like many of its compatriots on this list, including some small microbreweries that don’t see widespread distribution for the eager beer nerd. As an added bonus, Tallboys pours the traditional English 20 ounce pint, which can’t be said of all bars in the city. While focusing on Ontario craft might seem old, when the brewpub opened in 2012, it was one of the first in the area to champion local food and drink, and does so to this day with menu items such as the Koreatown burger complete with kimchi, bacon, cucumber, and green onion mayo. The Beerbistro is exactly as the name implies: a classy bistro where it would be acceptable to take your parents or boss, just with a lot of beer. 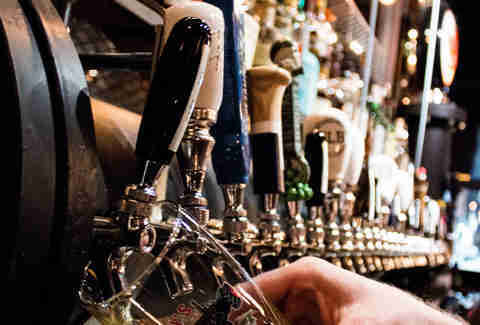 While the taps and bottles are impeccable, it’s the cellared beer list that’s the real star of the show at Beerbistro. 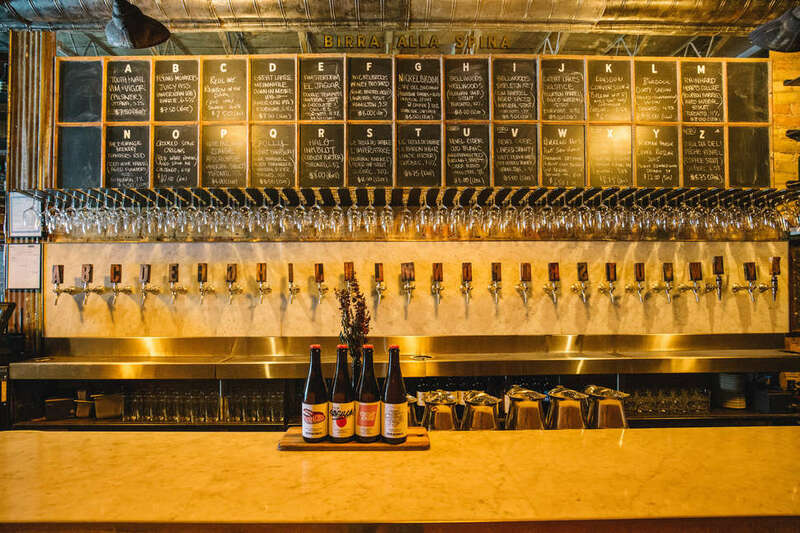 The cellaring programme at Beerbistro targets select beers and styles appropriate for aging, and matures them to allow their flavours to evolve. With bottles from around the world that have been aging for up to 10 years in the cellar, Beerbistro is a perfect place to feel classy af while slurping down mussels and splurging on these one-of-a-kind aged beers. Otto’s marries California-chic white tiles, good lighting, and hanging vines with the heartiness of solid German food and beer. The platters of sausage, veggies, bread, and typical German fare are massive, as is the beer list. 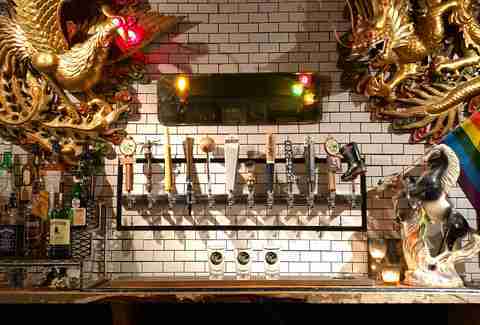 They have 24 taps and upwards of 50 bottles and cans featuring beer makers from Canada, Germany, and beyond. Feeling overwhelmed? The servers know their stuff and will gladly make a recommendation. Among the most grammable of the bars on this lists, book a boozy brunch with a large group of friends and be prepared to stand on a chair to capture your massive pint and platter. Beer and trivia are a match made in heaven, and Stout is perfectly catering to those who want to drink great beer and prove that they know a lot of random facts. The older sibling of Louis Cifer Brew Works, this classic Irish pub makes a mean shepherd’s pie and features a tap and bottle list of local craft beers, including a rotating hand-pumped cask ale in the Irish tradition. Afraid of having to come up with a witty trivia name in front of a crowded bar full of strangers? You and your date can nestle up next to the fireplace or chill on the covered patio with a board game instead. King Taps could also be renamed King of Taps if it wasn’t so cheesy, thanks to their monstrous 50 taps at this massive multi-level beer hall. Their taps include a rotating list of local breweries including Rainhard and Collective Arts as well as more commercial options such as Pilsner Urquell and Stella Artois to please a wide range of beer drinkers. There’s a definite bumping after-work atmosphere. You’ll find yourself waiting in line if you come in after 5pm, but if you’re hoping to watch the game, you’ve come to the right place. They have more TVs than taps -- a whopping 54 flat-screens for all the die-hard Toronto sports fans out there. Sarah Cooper is a Thrillist Toronto contributor who has more than once taken a Tinder date to the Only Cafe for the sole purpose of judging their taste in beer. Follow her eating and drinking adventures on @theone.whoeats.